HomeSpun Fitness is a back to basics approach to health and fitness developed from my years of experience, both as a teacher of effective, high-cardio workouts like Step and Spin, and as a strength trainer at the world famous “Pumping Iron” gym in New York. To help my clients reach their goals, including weight loss, toning, shaping, and life-long optimal health and fitness, I infuse all of my workouts with a specific balance of cardiovascular work and strength training. This philosophy flows through my classes and personal training sessions alike. I am certified by the American Council on Exercise (ACE) and a member of the International Dance Exercise Association (IDEA). Hosted in my professional studio that features spin bikes, treadmills, elliptical machines, and weight training equipment, my system is intense and concise, and only requires a 60-75 minute commitment, 2x per week, for tremendous fitness benefits. I offer private and semi-private sessions, as well specialty training (including Kettlebells, a highly effective strength and endurance conditioning approach) and small group classes, to provide affordable options for all. GROUP CLASSES: If you’re looking for a class that feels like a personal training session but is affordable AND has the added benefit of the strong bonds and support system found in a small class setting, then this is for you! With a designated time for your 2x per week, 75 minute workouts (including make-ups for planned absences), we kick class off with 30 minutes of intense cardio, then go into a 45-minute strength training session, focusing on your lower body during the first of your weekly sessions, and your upper body in the second. Designed for maximum efficiency, group classes give you a great bang for your buck and fantastic results! 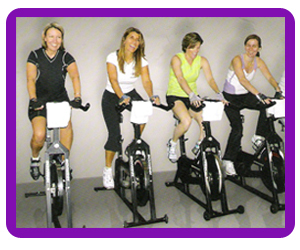 Spin & Lower Body Class Options: Pick your first weekly class at a time that works best for you on Monday or Tuesday. Monday options: 8:15 - 9:30 a.m. OR 6:00 - 7:15 p.m.
Tuesday: 7:00 - 8:15 p.m. Spin & Upper Body Class Options: Pick your second weekly class at time that works best for you on Wednesday or Thursday. Wednesday: 8:15 – 9:30 a.m.
Thursday options: 8:15 – 9:30 a.m. OR 6:00 - 7:15 p.m. Contact me for more information and to sign up for group classes. PERSONAL TRAINING: Available for individuals or training partners who want a highly individualized, specialized fitness routine, I’ll design a personal program to tackle the areas that you want to improve most as together we set -- and achieve -- your specific fitness goals. Contact me for more information about personal training. 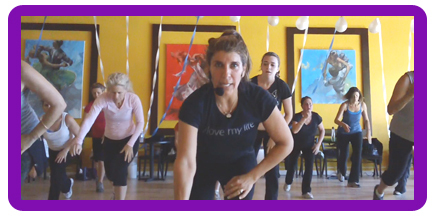 "Sweet Sati" is my personal take on intenSati, a practice developed by Patricia Moreno in New York City for your body, heart, and mind that is sweeping the nation. As the first certified intenSati instructor in the LA area, I've been devoted to the profound effects of this revolutionary high-energy cardio workout. Based on the teachings of mindfulness, positive psychology, and the Law of Attraction, intenSati combines aerobics, martial arts, and endurance principles with positive affirmations. The result is an unprecedented practice, which energizes and empowers you both physically and mentally. Classes, which last an hour and 15 minutes, are Tuesdays at 8:30 a.m. and Saturdays at 9:00 a.m. at my home studio.